Dart "Race Series" 389 Full Port CNC Heads For Big Block Chevy. Dart big block heads deliver superior performance without the hassles of welding and modifying stock castings. We applied proven Pro Stock technology to produce big block heads that out perform the competition - yet Dart heads can be used with most off the shelf pistons, manifolds, headers and valve train components. 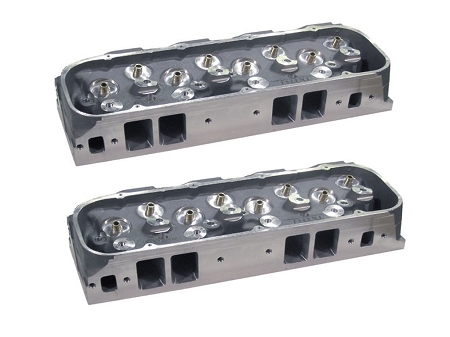 Features: - Premium alloy: Dart aluminum heads are cast from virgin 355-T61 aerospace alloy for superior strength and integrity. - Shallow combustion chamber design improves combustion and allows use of larger valves for improved airflow. - Interlocking ductile iron valve seats are compatible with stainless steel and titanium valves. - Spark plugs are shifted toward bore centerline to enhance flame travel and reduce spark advance requirement. - Refined intake port design reduces turbulence and increases air/fuel flow. - Gasketed 3/4" reach spark plugs offer widest selection of heat ranges. - All Cylinder Heads are being sold bare and in PAIRS.